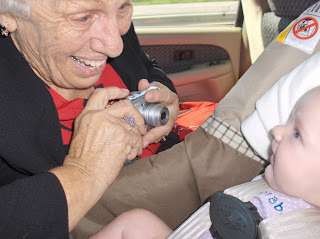 Warning: This entry contains lots of news, lots of photos, and lots of cuteness! So, September has been a busy month for us! The first weekend of the month, Kevin went on a 3 day men's retreat and Avery and I spent our first 3 days alone together. Thank goodness we have people to call on in such times, we were able to make it through. However, we were both really glad when he returned. The following Thursday was a big day for all 3 of us. 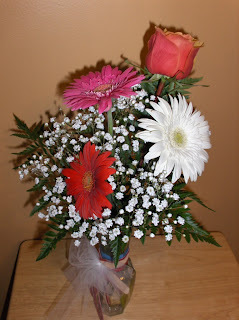 September 11 marks Kevin and I's 4th anniversary. 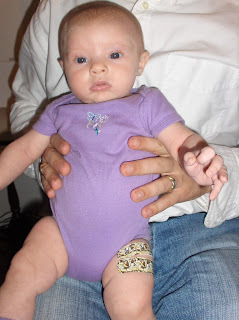 Who would have guessed that we would spend our 4th anniversary taking our daughter to get her first round of immunizations??? Because of that, Avery had a big day too. She received 3 shots in her legs and had to drink another. But she is such a trooper! She cried for just a few minutes and then slept much of the next 10 hours and that was all! The smiley baby we are used to was back! So, that night Kevin arranged for a babysitter, brought me flowers, and whisked me off to Zio's for dinner (which is the restaurant he proposed to me at). A big thanks to Helen for taking a newly immunized baby for the evening (although I am not sure she knew that when she agreed!). 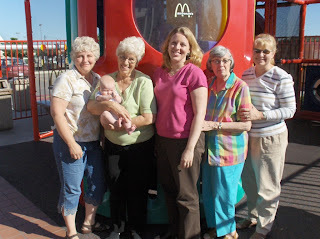 To continue celebrating our anniversary, my sister Amber had been planning to babysit Avery since before she was born. 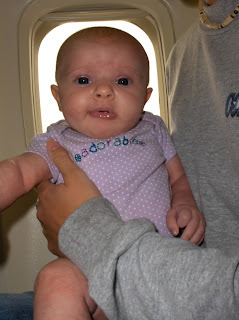 On Saturday morning she flew in to Kansas. 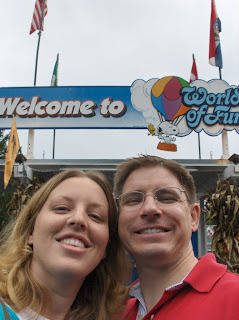 After a fantastic burger from the Grille ala Kevin, he and I went off to the Worlds of Fun theme park. We rode roller coaster after roller coaster and had a wonderful time! 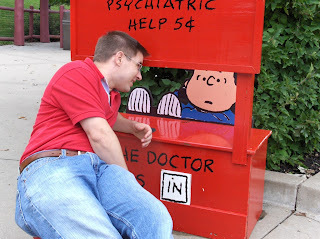 Kevin even visited the psychiatrist while we were there :). 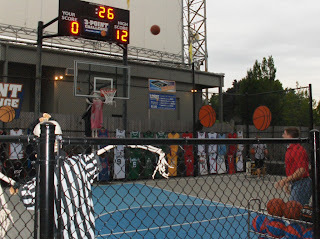 He also shot a few baskets in attempt to win an I-Phone, but no luck. On Sunday, when Amber was to return to Dallas, Avery and I joined her to meet up with some family who hadn't had a chance to meet Avery yet. 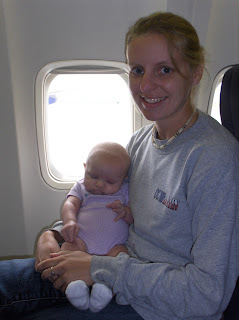 So she took her first airplane ride to the great state of Texas! Again she did amazingly well. She slept most of the trip and just relaxed for the rest of it. Take off and landing was no problem which was especially surprising since she was (and still is) experiencing her first stuffy nose. The trip to Texas was great. 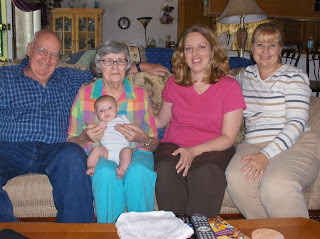 We saw Avery's grandparents and great-grandparents and great-aunt. We spent time in Fort Worth, Bridgeport, and Decatur. What a special time to introduce family to each other. Also, thank you to Cindy, Julie's friend in Fort Worth, for all she did to keep us at her house for a night. 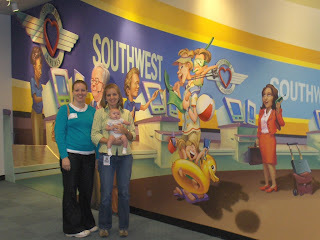 Just before returning to Kansas, Avery and I visited Amber's office where she got to show off the niece :). The flight back was almost just as easy. This time it was just Avery and I so there were a few challenges, but really it went great! Thank you Amber for helping us pull off this trip! Now, you might think that that is enough for one month, but no, this past weekend was my birthday, so there was more celebration going on! After a breakfast in bed of strawberry covered waffles, we went to a parade downtown. Each year the KU Marching Band leads off a parade of bands and this year it happened to be on my birthday. Kevin took the truck downtown early in the morning, so we had prime viewing area. Our friend Martha, a huge KU fan, came with us. This year's parade was way different than last year's parade in that last year we didn't have a almost-3 month old who wasn't a big fan of the percussion. But again, she slept right through most of it which teaches me not to worry about being quiet in the house during nap time! 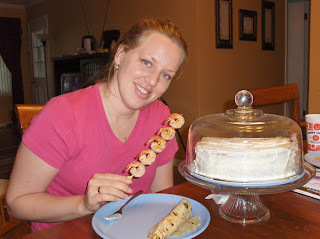 That night Kevin grilled fajitas and shrimp for me and baked a birthday cake which we took to some friends house and shared with them while visiting and watching the KU football game (which I think they won). 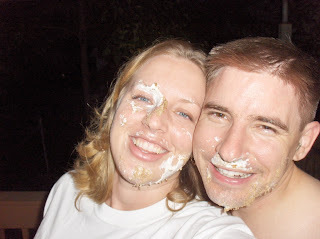 Later that evening, Kevin thought it would be fun to finish of the cake, so we did... Ewww!! Ok, now I think we are up to date! Please excuse our lack of updates, as you can see we have been very busy! 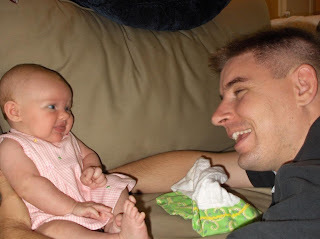 I believe we slow down a bit from here, but Avery will have lots to share as she is becoming very smiley and vocal which is lots of fun! Thanks for the pictures and sharing the wonderful month of FUN. Especially sharing Avery with us in Kansas. Was so good to be with you. "243"
Wow! You win the prize for longest blog ever! Looks like you guys have had quite a fun month. Happy belated Anniversary and Birthday! 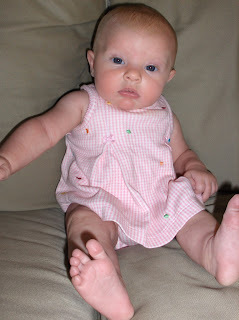 That little girl of yours gets cuter and cuter by the day!